Try these microwave containers for fast cooking or for keeping leftovers in the frig! Four bowls with lids make this Microwaveable Food Cups Set a desirable cookware set for any kitchen. Doubling as storage bowls, food is ready for instant heating and enjoyment. Microwave and dishwasher safe, this handy set is perfect for soups, stews, and leftovers. They also make good microwavable lunch containers for children in daycare and adults at work. Microwave dishes are great for quick, pick-me-up meals for busy families. Plastic food containers Are lightweight, easy to carry, easy to wash.
Lids included help stored foods remain fresh longer. 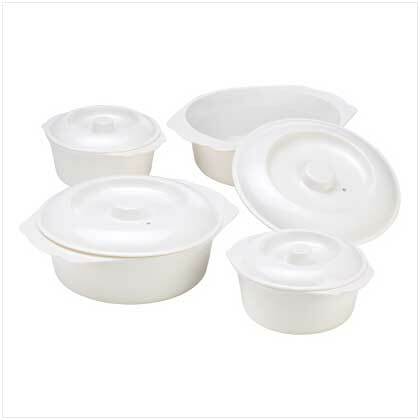 Two cup sizes Offer choice for cooking or storage capacity. Dishwasher safe Provides a sanitary method for cleaning.